This easy chicken makes an excellent filing for tacos or enchiladas, or can be an delicious addition to any taco bowl or salad. Place chicken breasts in pressure cooker. Sprinkle chicken breast with salt, cumin and oregano. Add onion and diced green chilis on top of chicken breast. Place lid on pressure cooker, set to high pressure and cook for 30 minutes. Quick release, then open when pressure subsides. Shred chicken and use as desired. Place chicken breasts in slow cooker. Sprinkle chicken breast with salt, cumin and oregano. Set slow cooker to low for 8 hours or high for 4 hours. 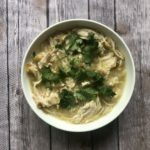 When slow cooker is done, shred chicken and use as desired.